Merivale find the magic with Fame! Everyone longs to have their names in lights and the glory of greatness under their belts, hoping that they will “live forever” in the hearts of adoring fans. Merivale High School’s musical production of Fame! brilliantly captured the lives of students who have that certain “something” and who are dying for their shot at stardom. Staged in the 1980s and written by David de Silva, Fame! touches on the four years of New York City’s prestigious High School that can make or break a performer. Faced with addiction, love lost and love found, disappointment and laughter, the musical follows the lives of passionate students working toward the same goal of fame and success. Absolutely electric, the large cast and crew of Merivale High School put on a performance that was beyond unforgettable. From beginning to end, the lively performers lit up the stage with their skill and chemistry, putting on an almost flawless performance. Big musical numbers, such as the explosive songs Hard Work and Dancing on the Sidewalk, were tight and together. “Three times the talent, 10 times the fun!” Madison Hayes-Crook played feisty, troubled diva Carmen Diaz. A powerful triple threat, Hayes-Crook stunned with her flavour-filled, intense character, as seen in the numbers Fame and In L.A. Diaz’s relationship with Schlomo Metzenbaum (played by Josh Toews) fuelled the plot, as the two struggled to love each other in the midst of her drug addiction and obsession with fame, which ultimately led to her demise. Natasha Jarrett as Serena Katz shone on stage, developing from a humble to an empowered actress. Her powerful singing voice pierced the audience, especially in Let’s Play a Love Scene. A dynamic actress, Jarrett proved to have natural comedic timing and chemistry, especially with Katz’s love interest Nick Piazza, played by Alex Boyd, who also had a strong, clear voice that resonated with the crowd. 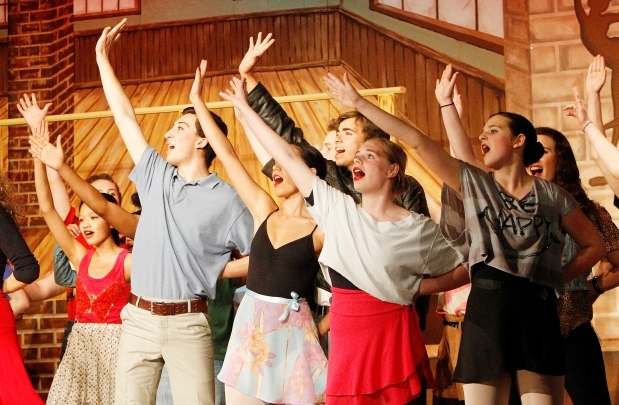 With a production as colossal as Fame!, Merivale High School was bound to have a cast of equally colossal talent. Tyrone Jackson (played by Jaelen Truong) epitomized the conflicts generated by a low socioeconomic background and discrimination and, with his unwavering demeanour, blew the crowd away. Iris Kelly (Danielle Denisko), Jackson’s love interest, moved with the delicate lines of a swan. As Mabel Washington, Kaija Thaggard stole the show, her high energy and powerful voice mixing with her character’s hilarious desperate longing for pudding to grant the audience a sweet experience with Mabel’s Prayer. From hair to makeup to costumes, Merivale delivered. Every aspect of the 1980s was brought to life, which added to the fun and funky retro atmosphere. Also, the talented pit band’s dynamics and timing were excellent. Merivale’s musical production of Fame! proved that, with hard work, passion and perseverance, “magic” can truly be made. Asha Maria Bost, critic, Canterbury High School: The marketing and publicity by Jaelen Truong, Victoria Beales, Ruby Pascoe and Evan Grice was of professional quality, featuring an extensive array of Facebook pages, video diaries, display cases, a blog, articles in the school newspaper, and articles in the EMC. Michael Hassar, lead critic, Colonel By Secondary School: The choreography by Chloe Gill and Danielle Denisko was impressive, making use of limited space to allow the large cast to engage in energetic dance numbers while still highlighting individual talents. Emma Reid, lead critic, Nepean High School: Any technical issues were quickly fixed by the efficient sound team of Daniel Brooks, Andrew Smith and Elaine Phan. Costumes were perfectly suited to each character, and makeup by Katya Kogan evolved to match the characters’ story arcs throughout the show. Taylor Maheral, critic, St. Francis Xavier High School: Arman Afkham kept the audience in stitches as the lascivious young skirt chaser Jos Vegas. His song Can’t Keep It Down, and his constant lusting for Carmen, made him a memorable presence. About the reviews: Fame! was reviewed by 38 critics representing 15 schools. The critic discussions were mentored by teacher Jessica Stevens of Philemon Wright High School and student reviews were edited and selected for publication by teacher JoAnne Hanna of Philemon Wright High School, who could see only the reviews, not the names or schools of the reviewers. Next review: Longfields-Davidson Heights Secondary School’s production of Lucky Stiff. The Citizen and 38 high schools are participating in the Cappies, a Washington, D.C.-based program that uses high school critics to review high school theatre. The program is a unique partnership between the Citizen, the Ottawa-Carleton District School Board and the Ottawa Catholic School Board. Four schools from other boards in the region and four private schools have also joined. The four winners of the lead acting categories will receive a bursary provided by the national law firm Gowling Lafleur Henderson LLP. Follow the Cappies on Twitter.com/OttawaCappies.